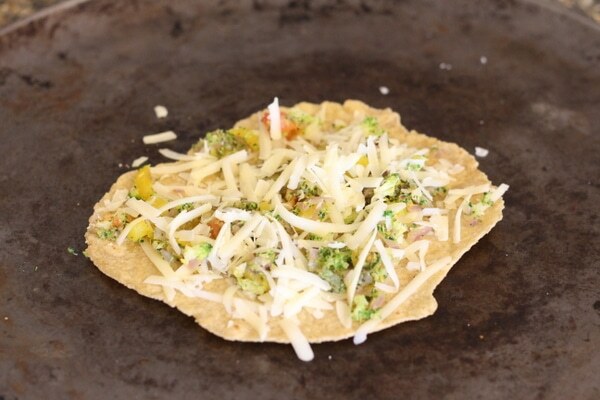 Crispy tortillas surround cheese, vegetables, and/or beans to make a less greasy version of a classic favorite! 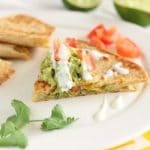 What is a ‘quesadilla’, some of you may wonder? Basically, it’s a naughty cheese crisp. 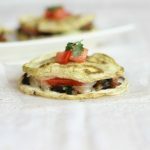 Two tortillas filled with cheese and a few other choice add-ins, are fried in some type of fat to create crispy, greasy goodness! 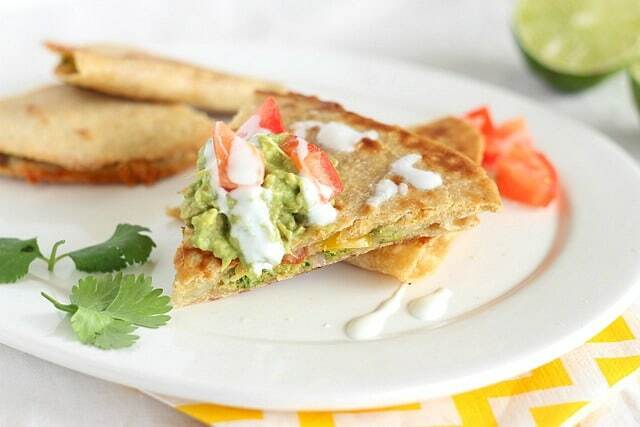 Over here, quesadillas are a real crowd-pleaser. What’s not to like?! While the traditional method of frying them in butter is delicious, I thought I’d try to clean them up a bit by using an oven method. You still get a crispy, cheesy bite, but with a bit less grease. 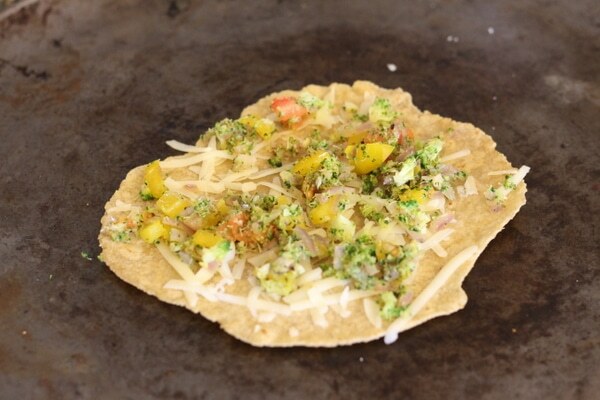 I like to fill our ‘dillas with various foods, including black beans, broccoli, onions, and peppers. They’re easy to customize, as you can add in whatever spices tickle your fancy. I’m a big fan of oregano, and Jade likes chili powder. 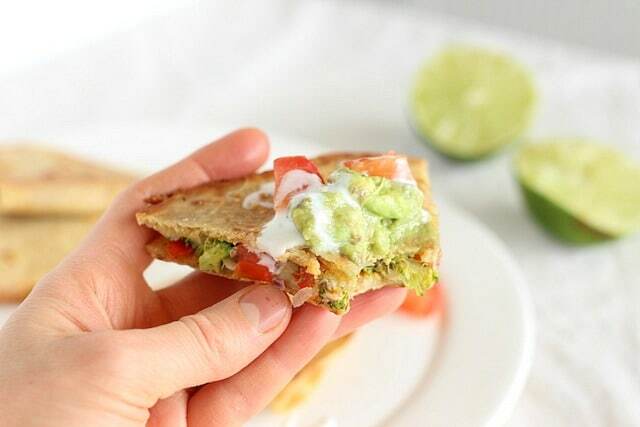 Another plus to baking them is that you can make multiple quesadillas at a time, which gets lunch or dinner on the table faster for hungry tummies! 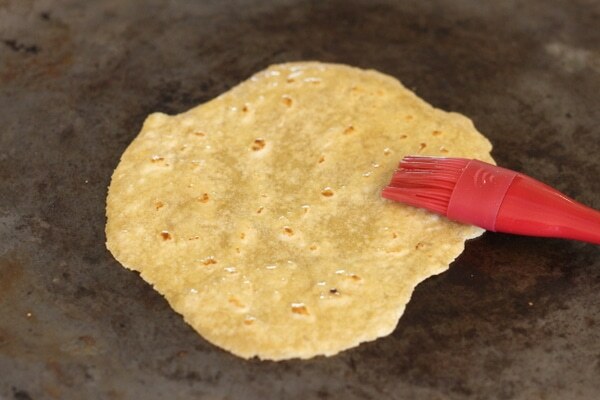 If you’re also so inclined, may I suggest going the extra mile and making your own tortillas? 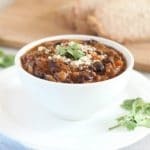 I love them, and make at least one batch every week! This recipe is my go-to, but I vary the flours I use, including spelt, wheat, and kamut. There are myriad ways to make these, depending on what you like or tolerate. 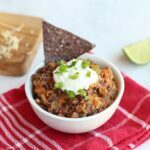 This recipe is my current favorite, as it helps the kids all eat their veggies! 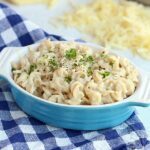 Delicious, veggie-packed, cheesy goodness that is sure to please picky eaters. 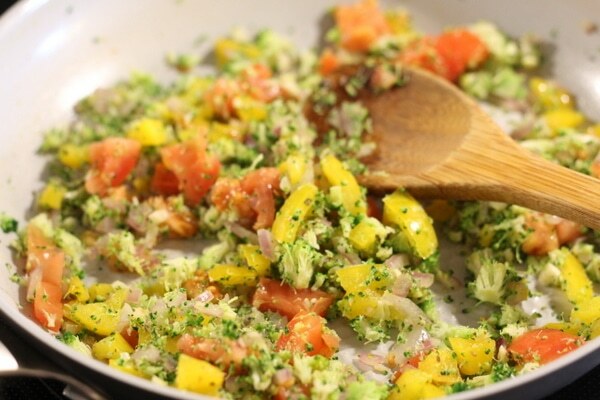 Heat one tablespoon of oil or butter in a large non-stick pan. Add the onion and garlic to the pan; saute 3-5 minutes until soft. Stir in the bell pepper, broccoli, and tomato, cooking for another 3-4 minutes. Add in any desired spices at this time. 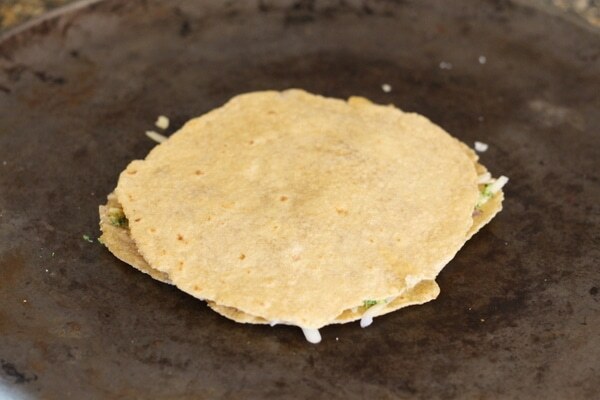 Begin making the quesadillas: On a plate, lay one tortilla. Brush one side of it with melted butter or coconut oil (you could also just spray it with oil, if available). Place the tortilla, oil side down, onto a baking sheet. Sprinkle with 1/4 cup of cheese. Top with veggie mixture and another 1/4 cup of cheese. 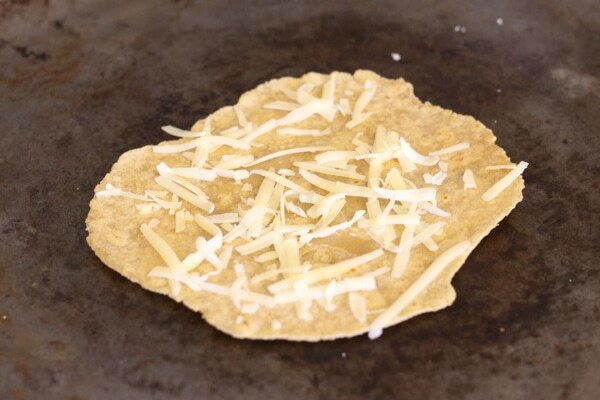 Place another tortilla on top of the cheese. Brush the top with a bit of butter, oil, or spray. 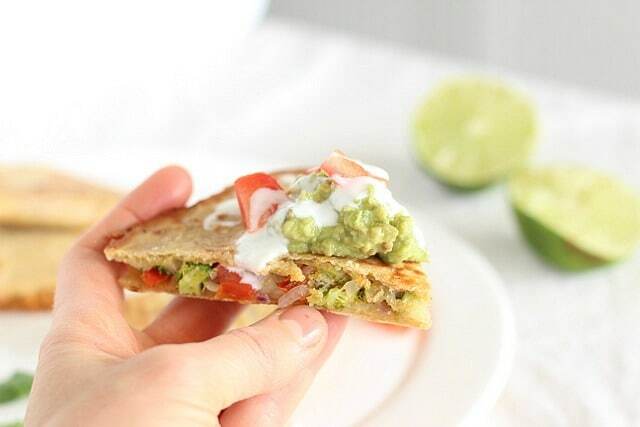 Repeat the process with the remaining ingredients to create your second quesadilla. 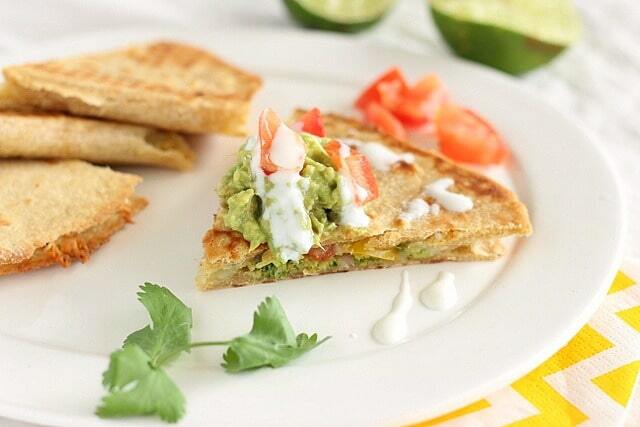 Bake the quesadillas for 7-10 minutes, until tops are golden brown. 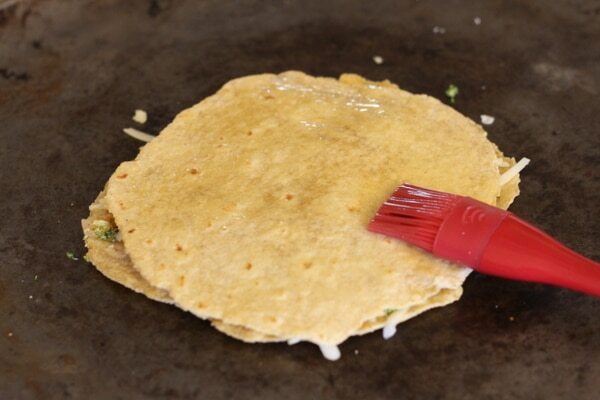 I like to use these tortillas with this recipe. Some ideas for accompaniments include: Yogurt, guacamole, salsa, scallions, tomatoes, and cilantro. …and brush that with butter or oil as well.